To show how the Klan used religion to further its agenda of hate while appealing to everyday Americans, Kelly Baker takes readers back to its "second incarnation" in the 1920s. During that decade, the revived Klan hired a public relations firm that suggested it could reach a wider audience by presenting itself as a "fraternal Protestant organization that championed white supremacy as opposed to marauders of the night." That campaign was so successful that the Klan established chapters in all forty-eight states. This engrossing expos looks closely at the Klan's definition of Protestantism, its belief in a strong relationship between church and state, its notions of masculinity and femininity, and its views on Jews and African Americans. 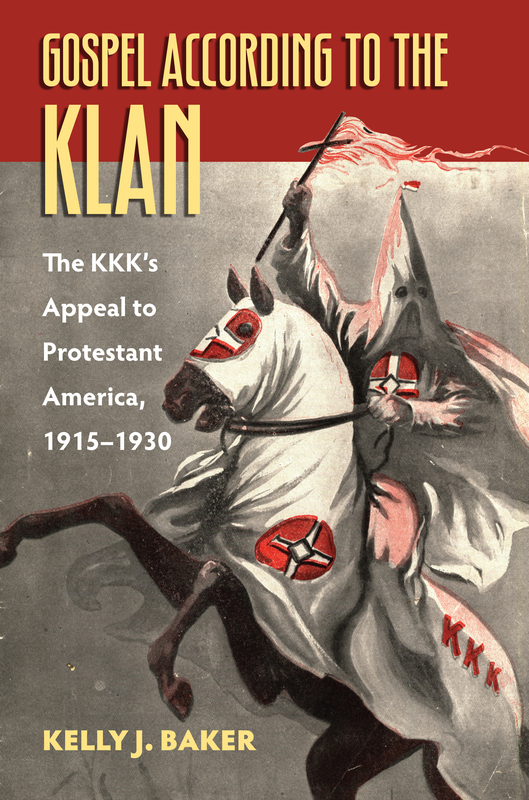 The book also examines in detail the Klan's infamous 1924 anti-Catholic riot at Notre Dame University and draws alarming parallels between the Klan's message of the 1920s and current posturing by some Tea Party members and their sympathizers. Analyzing the complex religious arguments the Klan crafted to gain acceptability—and credibility—among angry Americans, Baker reveals that the Klan was more successful at crafting this message than has been credited by historians. To tell American history from this startling perspective demonstrates that some citizens still participate in intolerant behavior to protect a fabled white Protestant nation. Kelly J. Baker is the editor of Women in Higher Education.